Celia Cruz, the Cuban-born singer who went from singing in Havana nightclubs to become the “Queen of Salsa,” died Wednesday, her publicist said. Cruz, who was 77, died of a brain tumor. She had surgery for the ailment in December but her health faltered. She died at her home in Fort Lee, N.J., according to her publicist, Blanca Lasalle. In the 1950s, Cruz became famous with the legendary Afro-Cuban group La Sonora Matancera. She left Cuba for the United States in 1960, and was credited with bringing salsa music to a broad audience. Called the “Queen of Salsa” and the “diva of Latin song,” Cruz remained energetic late into her career. At last year’s Latin Grammys, she showed up wearing a frothy blue-and-white headpiece and a tight red dress and gave a hip-shaking performance. Cruz’s alliance with fellow salsa star Tito Puente garnered her some of the biggest success in her career. In 1987, she was honored with a star on Hollywood’s Walk of Fame, and several years later, the city of Miami gave Calle Ocho, the main street of its Cuban community, the honorary name of Celia Cruz Way. Cruz also received a Lifetime Achievement Award from the Smithsonian Institution and in 1994, President Clinton honored her with an award from the National Endowment of the Arts. This entry was posted on Wednesday, July 16th, 2003 at 4:20 pm. It is filed under Special Feature and tagged with Celia Cruz, Cuban Salsa legend. You can follow any responses to this entry through the RSS 2.0 feed. 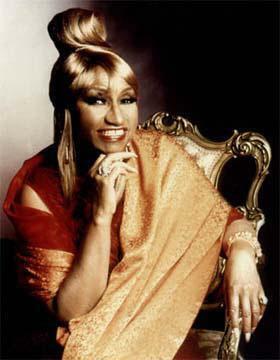 loved celia cruz because she refused to allow her age to define who she was. she remained true to herself, period. we should all be as fabulous. so sad to hear of her passing. Is it me or are we losing an unusual number of musical artists this year? I’m scared to think of who might be next. heaven must be pretty needy of entertainment… sad news for us her on earth indeed. I’ll miss her joyous Cubana flair — was she ever without a smile? Azucarrrr! The smile, the energy, the flair and music was this Afro-Cuban legend’s embrace for me…. that and growing up in a neighborhood which transitioned to mostly people of Latin descent and hearing her music blaring from Friday, Saturday and Sunday house parties.